Larry, a.k.a. Dr. Meangreen is a horror host and historian who writes on the subject. 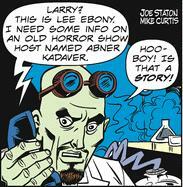 Larry is an old free of Lee Ebony’s, and she asked for him for information on Abner Kadaver, an old tv horror host who lost his job when the network replaced him with a 19-year-old fan named Baron Clovis to cut costs. Meangreen was quick to point out that the costumed skeleton found in Kadaver’s house of terror looked like the young replacement’s Baron Clovis costume.